On Oranienburgstrasse is a large synagogue (built in 1866) whose large prayer hall once seated 3,000 people. Today, the building is used by an organization known as Centrum Judaicum, a Jewish community center with a small museum. In 1930, Albert Einstein once played his violin in the synagogue. The Jewish quarter where the synagogue is situated was the site of several pogroms. In 1938, during Kristallnacht, the synagogue was set on fire but was saved from being burned badly by an area police chief. 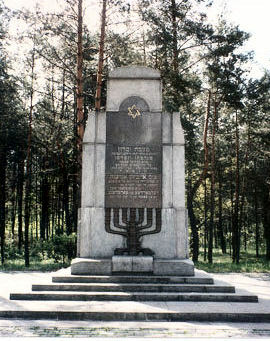 In the early forties, it was used as a gathering point for the Jews before they were sent to concentration camps. 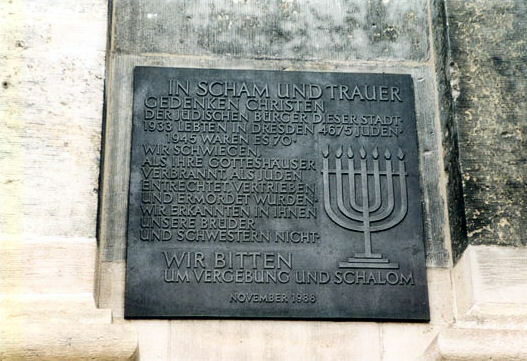 During World War II, the Germans built a concrete bunker in the main hall of the synagogue; thus, in 1943, the synagogue was damaged by Allied air raids. 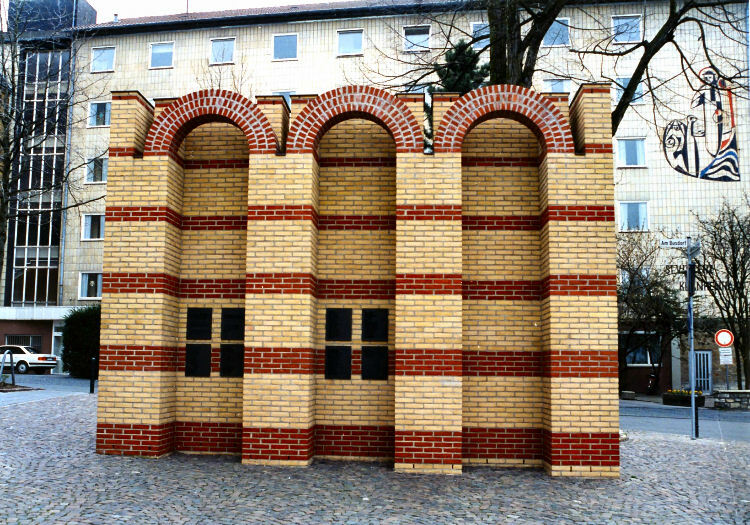 With the aid of philanthropist Roland Lauder and others, the synagogue was eventually restored, the work commencing in 1988. It is said that in the course of the repairs, workers found a non-extinguishing lamp. "At this point, there was the first retirement home of the Jewish community of Berlin. 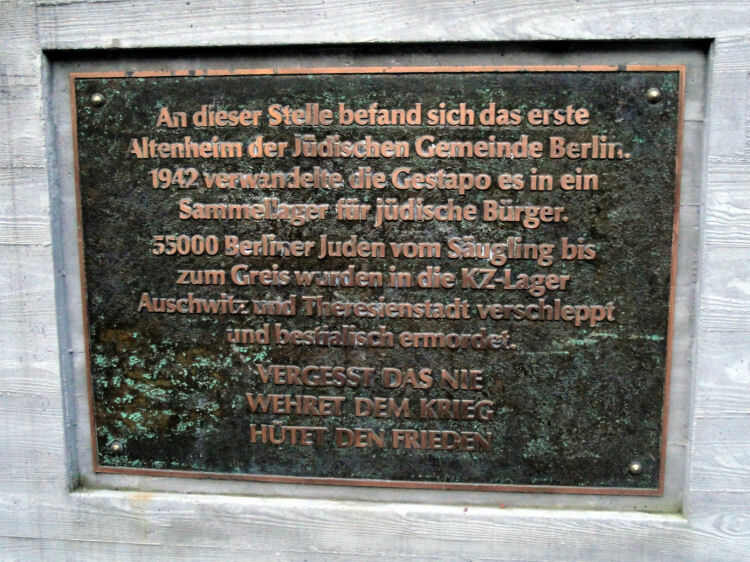 1942 transformed the Gestapo to a concentration camp for Jewish Burger. 55,000 Berlin Jews from the infant to the elderly were dragged to concentration camps Auschwitz and Theresienstadt and brutally murdered." 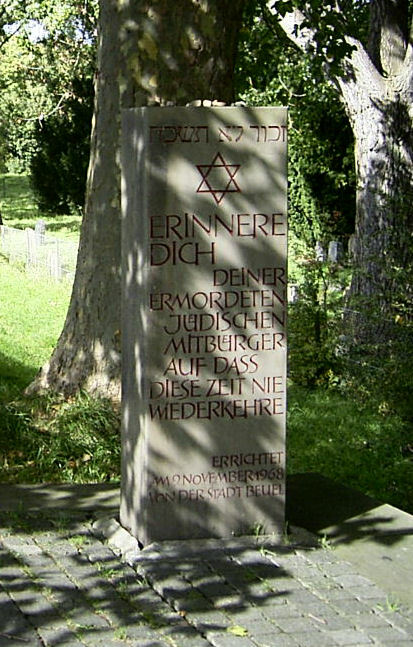 The Jewish cemetery on Oranienburgstrasse in Berlin is located in a quarter where Jews used to live. Most of their institutions could be found here, including a synagogue and an asylum for elderly Jews. With the rise of Nazism in Germany, many Jews left the neighborhood before it was too late. Unfortunately, the Jews who were too elderly could not leave and presumably perished at some point before or during the war. The sculpture in this garden is dedicated to these tragically doomed people. 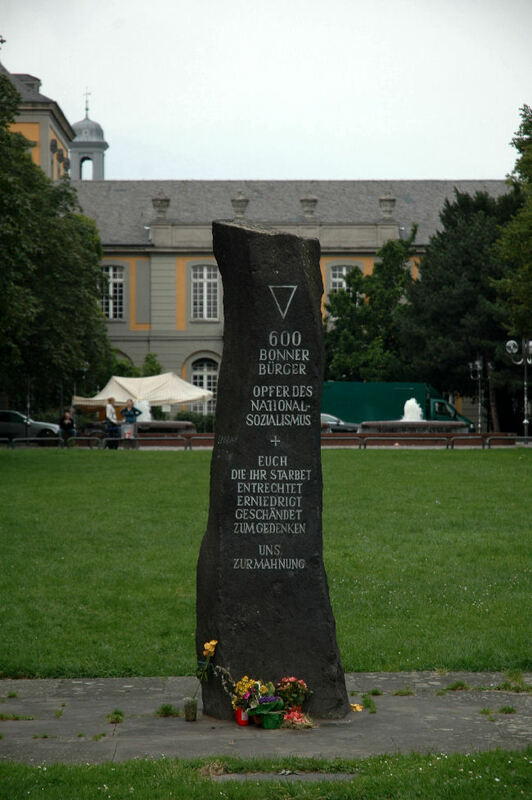 Memorial to the victims of National Socialism in Bonn at Kaiserplatz, in the center of the city. 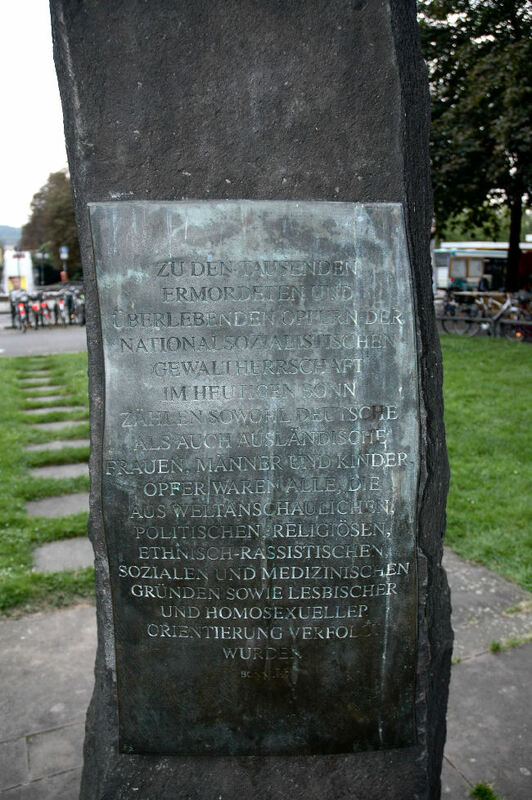 The stone was installed in 1950, first at the Hofgarten, a large park by the University of Bonn. In 1969, the memorial was moved in the wake of the subway construction in the Public Garden, where it fell a bit into oblivion. Only in 1997, the stone came to its present location. The front text originated from the year 1950 and described an incorrect number of casualties, so on the back of the stone, a revised text was written. "Remember your murdered Jews more....that this time will never return." 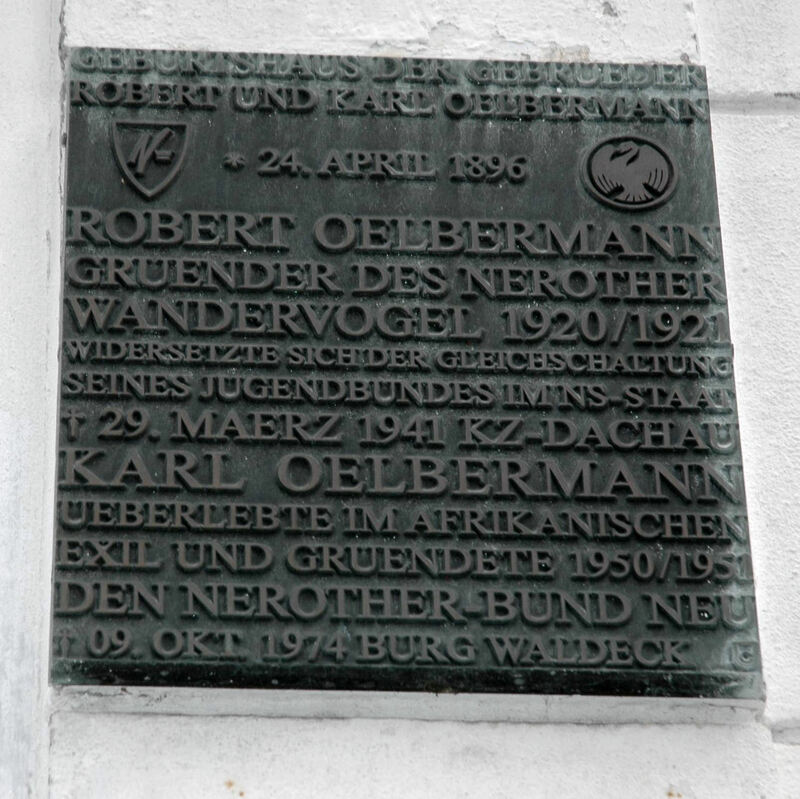 At number 27 Colmanstrasse is a memorial plaque to the twin brothers Oelbermann who were both born in this house. As founders of the Federal Nerother migrant bird (Wandervogel) and committed leaders of the youth movement, they fell under the Nazi persecution. Survived in exile in Africa and found the New Nerother Union in 1950-1. Christians remember the Jewish citizens of this city. In 1945, there were but 70. We were silent when their houses of worship were burned. We did not accept Jews as our brothers and sisters when they were disenfranchised, deported and murdered. 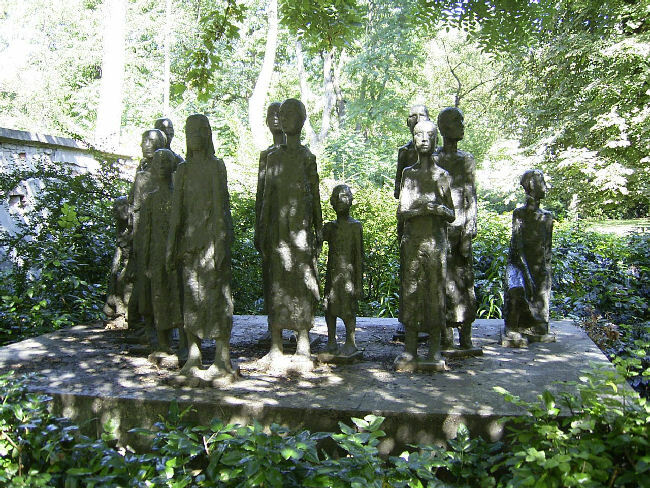 After WWII, there was a displaced persons' camp in Hofgeismar, Hesse, Germany. May their souls be bound in the knot of life. 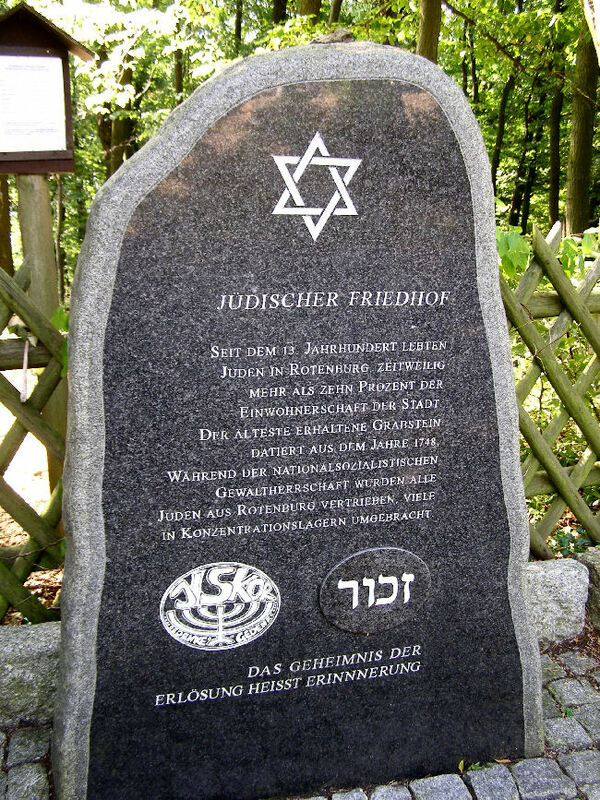 "Memorial on the site of the Great Community Synagogue in remembrance of the segregated, persecuted and murdered Jewish citizens of Leipzig during the time of National Socialist Rule." 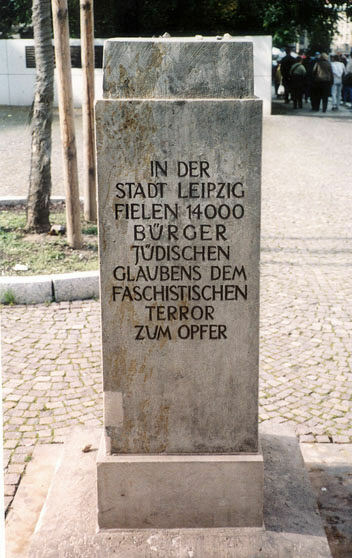 photos, left: "In the city of Leigpzig, 1400 citizens of Jewish faith fell victim to the Fascist terror." 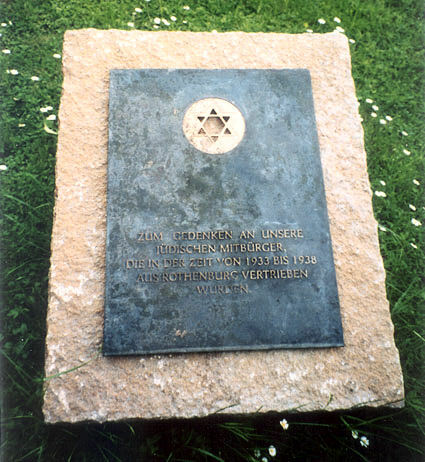 The eight metal plates list the names of the Holocaust Victims. 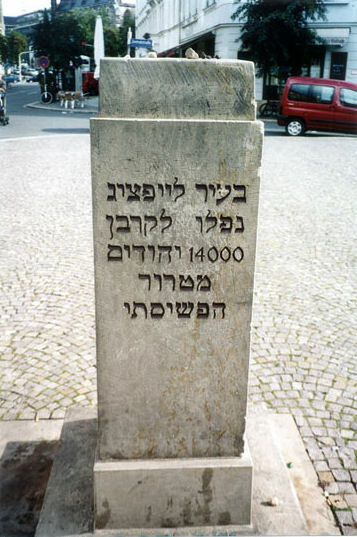 The memorial, called a "Mahnmal" (Mahnen means to admonish or remind; the "mal" portion denotes it to be a memorial like "Denkmal") it is located in the space where the old Synagogue stood, The street name is "Am Busdorf". It is a 1996 Photo. The view is to the south. In the background is the St. Vincenz Hospital. Foto: Stadtarchiv Paderborn / Trapp. 1. 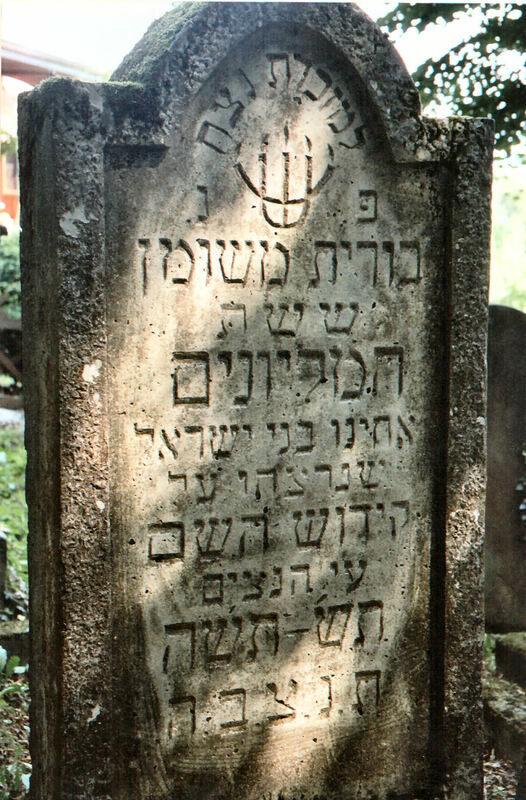 The Jewish community and Jewish cemetery, where the oldest gravestone dates back to 1748. 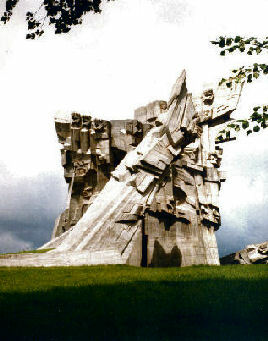 The memorial stands at the entrance to the cemetery. "To the memory of our Jewish townspeople, ...of the time of 1933 to 1938 (taken) out of Rothenburg..."